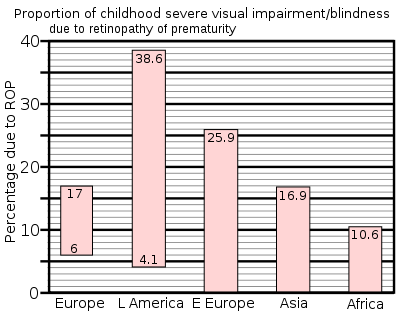 The majority of infants who have survived following an incidence of bronchopulmonary dysplasia will eventually recover near-normal lung function, since lungs continue to grow during the first 5–7 years and the damage caused by bronchopulmonary dysplasia is to some extent reversible (even in adults). However, they are likely to be more susceptible to respiratory infections for the rest of their lives and the severity of later infections is often greater than that in their peers. 1 2 3 Donald, Part I 1947. 1 2 Clark & Thom 2003, pp. 358–360. 1 2 Acott, Chris (1999). "Oxygen toxicity: A brief history of oxygen in diving". South Pacific Underwater Medicine Society Journal. 29 (3): 150–5. ISSN 0813-1988. OCLC 16986801. Retrieved 29 April 2008. ↑ Beehler, CC (1964). "Oxygen and the eye". Survey of Ophthalmology. 45: 549–60. PMID 14232720. ↑ Goldstein, JR; Mengel, CE (1969). "Hemolysis in mice exposed to varying levels of hyperoxia". Aerospace Medicine. 40 (1): 12–13. PMID 5782651. ↑ Larkin, EC; Adams, JD; Williams, WT; Duncan, DM (1972). "Hematologic responses to hypobaric hyperoxia". American Journal of Physiology. 223 (2): 431–7. PMID 4403030. ↑ Schaffner, Fenton; Felig, Philip (1965). "CHANGES IN HEPATIC STRUCTURE IN RATS PRODUCED BY BREATHING PURE OXYGEN" (PDF). Journal of Cell Biology. 27 (3): 505–17. doi:10.1083/jcb.27.3.505. PMC 2106769 . PMID 5885427. ↑ Caulfield, JB; Shelton, RW; Burke, JF (1972). "Cytotoxic effects of oxygen on striated muscle". Archives of Pathology. 94 (2): 127–32. PMID 5046798. ↑ Bean, JW; Johnson, PC (1954). "Adrenocortical response to single and repeated exposure to oxygen at high pressure". American Journal of Physiology. 179 (3): 410–4. PMID 13228600. ↑ Edstrom, JE; Rockert, H (1962). "The effect of oxygen at high pressure on the histology of the central nervous system and sympathetic and endocrine cells". Acta Physiologica Scandinavica. 55 (2–3): 255–63. doi:10.1111/j.1748-1716.1962.tb02438.x. PMID 13889254. ↑ Gersh, I; Wagner, CE (1945). "Metabolic factors in oxygen poisoning". American Journal of Physiology. 144 (2): 270–7. ↑ Hess, RT; Menzel, DB (1971). "Effect of dietary antioxidant level and oxygen exposure on the fine structure of the proximal convoluted tubules". Aerospace Medicine. 42 (6): 646–9. PMID 5155150. 1 2 3 4 5 Patel, Dharmeshkumar N; Goel, Ashish; Agarwal, SB; Garg, Praveenkumar; Lakhani, Krishna K (2003). "Oxygen toxicity" (PDF). Journal, Indian Academy of Clinical Medicine. 4 (3): 234–237. Retrieved 28 September 2008. 1 2 Clark & Thom 2003, p. 376. 1 2 3 U.S. Navy Diving Manual 2011, p. 44, vol. 1, ch. 3. 1 2 3 4 Bitterman, N (2004). "CNS oxygen toxicity". Undersea and Hyperbaric Medicine. 31 (1): 63–72. PMID 15233161. Retrieved 29 April 2008. 1 2 Richardson, Drew; Menduno, Michael; Shreeves, Karl, eds. (1996). "Proceedings of rebreather forum 2.0". Diving Science and Technology Workshop: 286. Retrieved 20 September 2008. 1 2 3 4 Richardson, Drew; Shreeves, Karl (1996). "The PADI enriched air diver course and DSAT oxygen exposure limits". South Pacific Underwater Medicine Society Journal. 26 (3). ISSN 0813-1988. OCLC 16986801. Retrieved 2 May 2008. 1 2 Bitterman, N; Melamed, Y; Perlman, I (1986). "CNS oxygen toxicity in the rat: role of ambient illumination". Undersea Biomedical Research. 13 (1): 19–25. PMID 3705247. Retrieved 20 September 2008. 1 2 Bitterman, N; Schaal, S (1995). "Caffeine attenuates CNS oxygen toxicity in rats". Brain Research. 696 (1–2): 250–3. doi:10.1016/0006-8993(95)00820-G. PMID 8574677. 1 2 3 4 Clark & Thom 2003, p. 383. ↑ Clark, John M; Lambertsen, Christian J (1971). "Pulmonary oxygen toxicity: a review". Pharmacological Reviews. 23 (2): 37–133. PMID 4948324. 1 2 3 Clark, John M; Lambertsen, Christian J (1971). "Rate of development of pulmonary O2 toxicity in man during O2 breathing at 2.0 Ata". Journal of Applied Physiology. 30 (5): 739–52. PMID 4929472. 1 2 3 Smith, J Lorrain (1899). "The pathological effects due to increase of oxygen tension in the air breathed" (PDF). Journal of Physiology. London: The Physiological Society and Blackwell Publishing. 24 (1): 19–35. PMC 1516623 . PMID 16992479. Note: 1 atmosphere (atm) is 1.013 bars. ↑ Fielder, Alistair R (1993). Fielder, Alistair R; Best, Anthony; Bax, Martin C O, eds. The Management of Visual Impairment in Childhood. London: Mac Keith Press : Distributed by Cambridge University Press. p. 33. ISBN 0-521-45150-7. 1 2 Smerz, RW (2004). "Incidence of oxygen toxicity during the treatment of dysbarism". Undersea and Hyperbaric Medicine. 31 (2): 199–202. PMID 15485081. Retrieved 30 April 2008. ↑ Hampson, Neal B; Simonson, Steven G; Kramer, CC; Piantadosi, Claude A (1996). "Central nervous system oxygen toxicity during hyperbaric treatment of patients with carbon monoxide poisoning". Undersea and Hyperbaric Medicine. 23 (4): 215–9. PMID 8989851. Retrieved 29 April 2008. 1 2 Lang 2001, p. 7. 1 2 3 4 Bitterman, H (2009). "Bench-to-bedside review: Oxygen as a drug". Critical Care. 13 (1): 205. doi:10.1186/cc7151. PMC 2688103 . PMID 19291278. 1 2 3 Jackson, RM (1985). "Pulmonary oxygen toxicity" (PDF). Chest. 88 (6): 900–905. doi:10.1378/chest.88.6.900. PMID 3905287. ↑ Demchenko, Ivan T; Welty-Wolf, Karen E; Allen, Barry W; Piantadosi, Claude A (2007). "Similar but not the same: normobaric and hyperbaric pulmonary oxygen toxicity, the role of nitric oxide". American Journal of Physiology. Lung Cellular and Molecular Physiology. 293 (1): L229–38. doi:10.1152/ajplung.00450.2006. PMID 17416738. 1 2 Bancalari, Eduardo; Claure, Nelson; Sosenko, Ilene RS (2003). "Bronchopulmonary dysplasia: changes in pathogenesis, epidemiology and definition". Seminars in Neonatology. London: Elsevier Science. 8 (1): 63–71. doi:10.1016/S1084-2756(02)00192-6. PMID 12667831. 1 2 Yarbrough, OD; Welham, W; Brinton, ES; Behnke, Alfred R (1947). "Symptoms of Oxygen Poisoning and Limits of Tolerance at Rest and at Work". Nedu-47-01. United States Navy Experimental Diving Unit Technical Report. Retrieved 29 April 2008. 1 2 3 Anderson, B; Farmer, Joseph C (1978). "Hyperoxic myopia". Transactions of the American Ophthalmological Society. 76: 116–24. PMC 1311617 . PMID 754368. ↑ Ricci, B; Lepore, D; Iossa, M; Santo, A; D'Urso, M; Maggiano, N (1990). "Effect of light on oxygen-induced retinopathy in the rat model. Light and OIR in the rat". Documenta Ophthalmologica. 74 (4): 287–301. doi:10.1007/BF00145813. PMID 1701697. 1 2 3 Drack, AV (1998). "Preventing blindness in premature infants". New England Journal of Medicine. 338 (22): 1620–1. doi:10.1056/NEJM199805283382210. PMID 9603802. 1 2 Butler, Frank K; White, E; Twa, M (1999). "Hyperoxic myopia in a closed-circuit mixed-gas scuba diver". Undersea and Hyperbaric Medicine. 26 (1): 41–5. PMID 10353183. Retrieved 29 April 2009. ↑ Nichols, CW; Lambertsen, Christian (1969). "Effects of high oxygen pressures on the eye". New England Journal of Medicine. 281 (1): 25–30. doi:10.1056/NEJM196907032810106. PMID 4891642. ↑ Shykoff, Barbara E (2005). "Repeated Six-Hour Dives 1.35 ATM Oxygen Partial Pressure". Nedu-Tr-05-20. Panama City, FL, USA: US Naval Experimental Diving Unit Technical Report. Retrieved 19 September 2008. ↑ Shykoff, Barbara E (2008). 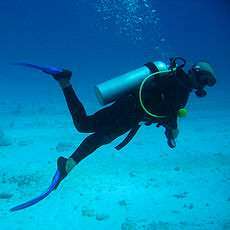 "Pulmonary effects of submerged oxygen breathing in resting divers: repeated exposures to 140 kPa". Undersea and Hyperbaric Medicine. 35 (2): 131–43. PMID 18500077. 1 2 3 Anderson Jr, B; Shelton, DL (1987). "Axial length in hyperoxic myopia". In: Bove, Alfred A; Bachrach, Arthur J; Greenbaum, Leon (eds.) Ninth International Symposium of the UHMS. Undersea and Hyperbaric Medical Society: 607–11. ↑ Schaal, S; Beiran, I; Rubinstein, I; Miller, B; Dovrat, A (2005). 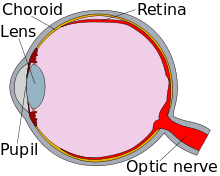 "Oxygen effect on ocular lens". Harefuah (in Hebrew). 144 (11): 777–780, 822. PMID 16358652. ↑ Rhee, SG (2006). "Cell signaling. H2O2, a necessary evil for cell signaling". Science. 312 (5782): 1882–1883. doi:10.1126/science.1130481. PMID 16809515. ↑ Thom, Steven R (1992). "Inert gas enhancement of superoxide radical production". Archives of Biochemistry and Biophysics. 295 (2): 391–6. doi:10.1016/0003-9861(92)90532-2. PMID 1316738. ↑ Ghio, Andrew J; Nozik-Grayck, Eva; Turi, Jennifer; Jaspers, Ilona; Mercatante, Danielle R; Kole, Ryszard; Piantadosi, Claude A (2003). "Superoxide-dependent iron uptake: a new role for anion exchange protein 2". American Journal of Respiratory Cell and Molecular Biology. 29 (6): 653–60. doi:10.1165/rcmb.2003-0070OC. PMID 12791678. ↑ Fridovich, I (1998). "Oxygen toxicity: a radical explanation" (PDF). Journal of Experimental Biology. 201 (8): 1203–9. PMID 9510531. ↑ Piantadosi, Claude A (2008). "Carbon Monoxide, Reactive Oxygen Signaling, and Oxidative Stress". Free Radical Biology & Medicine. 45 (5): 562–9. doi:10.1016/j.freeradbiomed.2008.05.013. PMC 2570053 . PMID 18549826. ↑ Imlay, JA (2003). "Pathways of oxidative damage". Annual Review of Microbiology. 57: 395–418. doi:10.1146/annurev.micro.57.030502.090938. PMID 14527285. ↑ Bowen, R. "Free Radicals and Reactive Oxygen". Colorado State University. Retrieved 26 September 2008. ↑ Oury, TD; Ho, YS; Piantadosi, Claude A; Crapo, JD (1992). "Extracellular superoxide dismutase, nitric oxide, and central nervous system O2 toxicity" (PDF). Proceedings of the National Academy of Sciences of the United States of America. 89 (20): 9715–9. Bibcode:1992PNAS...89.9715O. doi:10.1073/pnas.89.20.9715. PMC 50203 . PMID 1329105. ↑ Thom, Steven R; Marquis, RE (1987). "Free radical reactions and the inhibitory and lethal actions of high-pressure gases". Undersea Biomedical Research. 14 (6): 485–501. PMID 2825395. Retrieved 26 September 2008. ↑ Djurhuus, R; Svardal, AM; Thorsen, E (1999). "Glutathione in the cellular defense of human lung cells exposed to hyperoxia and high pressure". Undersea and Hyperbaric Medicine. 26 (2): 75–85. PMID 10372426. Retrieved 26 September 2008. ↑ Freiberger, John J; Coulombe, Kathy; Suliman, Hagir; Carraway, Martha-sue; Piantadosi, Claude A (2004). "Superoxide dismutase responds to hyperoxia in rat hippocampus". Undersea and Hyperbaric Medicine. 31 (2): 227–32. PMID 15485085. Retrieved 26 September 2008. ↑ Kim, YS; Kim, SU (1991). "Oligodendroglial cell death induced by oxygen radicals and its protection by catalase". Journal of Neuroscience Research. 29 (1): 100–6. doi:10.1002/jnr.490290111. PMID 1886163. ↑ NBDHMT (4 February 2009). "Recommended Guidelines for Clinical Internship in Hyperbaric Technology (V: C.D)". Harvey, LA: National Board of Diving and Hyperbaric Medical Technology. Archived from the original on 20 September 2007. Retrieved 26 March 2009. ↑ "How is bronchopulmonary dysplasia diagnosed?". U.S. Department of Health & Human Services. Retrieved 28 September 2008. 1 2 3 4 Lang 2001, p. 195. ↑ Butler, Frank K; Thalmann; Edward D (1986). "Central nervous system oxygen toxicity in closed circuit scuba divers II". Undersea Biomedical Research. 13 (2): 193–223. PMID 3727183. Retrieved 29 April 2008. ↑ Butler, Frank K (2004). "Closed-circuit oxygen diving in the U.S. Navy". Undersea and Hyperbaric Medicine. 31 (1): 3–20. PMID 15233156. Retrieved 29 April 2008. ↑ Baker, Erik C (2000). "Oxygen toxicity calculations" (PDF). Retrieved 29 June 2009. 1 2 Hamilton, RW; Kenyon, David J; Peterson, RE; Butler, GJ; Beers, DM (1988). "Repex habitat diving procedures: Repetitive vertical excursions, oxygen limits, and surfacing techniques". Technical Report 88-1A. Rockville, MD: NOAA Office of Undersea Research. Retrieved 29 April 2008. 1 2 Hamilton, Robert W; Kenyon, David J; Peterson, RE (1988). "Repex habitat diving procedures: Repetitive vertical excursions, oxygen limits, and surfacing techniques". Technical Report 88-1B. Rockville, MD: NOAA Office of Undersea Research. Retrieved 29 April 2008. 1 2 Hamilton, Robert W (1997). "Tolerating oxygen exposure". South Pacific Underwater Medicine Society Journal. 27 (1). ISSN 0813-1988. OCLC 16986801. Retrieved 29 April 2008. ↑ Latham, Emi (7 November 2008). "Hyperbaric Oxygen Therapy: Contraindications". Medscape. Retrieved 25 September 2008. ↑ Schatte, CL (1977). "Dietary selenium and vitamin E as a possible prophylactic to pulmonary oxygen poisoning". Proceedings of the Sixth International Congress on Hyperbaric Medicine, University of Aberdeen, Aberdeen, Scotland. Aberdeen: Aberdeen University Press: 84–91. ISBN 0-08-024918-3. OCLC 16428246. ↑ Boadi, WY; Thaire, L; Kerem, D; Yannai, S (1991). "Effects of dietary supplementation with vitamin E, riboflavin and selenium on central nervous system oxygen toxicity". Pharmacology & Toxicology. 68 (2): 77–82. doi:10.1111/j.1600-0773.1991.tb02039.x. PMID 1852722. ↑ Piantadosi, Claude A (2006). In: The Mysterious Malady: Toward an understanding of decompression injuries (DVD). Global Underwater Explorers. Retrieved 2 April 2012. ↑ Stone, WL; Henderson, RA; Howard, GH; Hollis, AL; Payne, PH; Scott, RL (1989). "The role of antioxidant nutrients in preventing hyperbaric oxygen damage to the retina". Free Radical Biology & Medicine. 6 (5): 505–12. doi:10.1016/0891-5849(89)90043-9. PMID 2744583. ↑ "UK Retinopathy of Prematurity Guideline" (PDF). Royal College of Paediatrics and Child Health, Royal College of Ophthalmologists & British Association of Perinatal Medicine. 2007. p. i. Retrieved 2 April 2009. ↑ Silverman, William (1980). Retrolental Fibroplasia: A Modern Parable. Grune & Stratton. pp. 39, 41, 143. ISBN 978-0-8089-1264-4. 1 2 Webb, James T; Olson, RM; Krutz, RW; Dixon, G; Barnicott, PT (1989). "Human tolerance to 100% oxygen at 9.5 psia during five daily simulated 8-hour EVA exposures". Aviation, Space, and Environmental Medicine. 60 (5): 415–21. doi:10.4271/881071. PMID 2730484. ↑ Mitchell, Simon J (20 January 2008). "Standardizing CCR rescue skills". RebreatherWorld. Retrieved 26 May 2009. This forum post's author chairs the diving committee of the Undersea and Hyperbaric Medical Society. ↑ Mitchell, Simon J; Bennett, Michael H; Bird, Nick; Doolette, David J; Hobbs, Gene W; Kay, Edward; Moon, Richard E; Neuman, Tom S; Vann, Richard D; Walker, Richard; Wyatt, HA (2012). "Recommendations for rescue of a submerged unresponsive compressed-gas diver". Undersea & Hyperbaric Medicine : Journal of the Undersea and Hyperbaric Medical Society, Inc. 39 (6): 1099–108. PMID 23342767. Retrieved 13 March 2013. ↑ Thalmann, Edward D (2 December 2003). "OXTOX: If You Dive Nitrox You Should Know About OXTOX". Divers Alert Network. Retrieved 11 October 2015. – Section "What do you do if oxygen toxicity or a convulsion happens?" ↑ "NIH MedlinePlus: Bronchopulmonary dysplasia". U.S. National Library of Medicine. Retrieved 2 October 2008. ↑ Lambertsen, Christian J (1965). Fenn, WO; Rahn, H, eds. "Effects of oxygen at high partial pressure". Handbook of Physiology: Respiration. American Physiological Society. Sec 3 Vol 2: 1027–46. ↑ "National Institutes of Health: What is bronchopulmonary dysplasia?". U.S. Department of Health & Human Services. Retrieved 2 October 2008. ↑ Spear, Michael L – reviewer (June 2008). "Bronchopulmonary dysplasia (BPD)". Nemours Foundation. Retrieved 3 October 2008. 1 2 3 Gilbert, Clare (1997). "Retinopathy of prematurity: epidemiology". Journal of Community Eye Health. London: International Centre for Eye Health. 10 (22): 22–4. ↑ Gerth, Wayne A (2006). "Decompression sickness and oxygen toxicity in U.S. Navy surface-supplied He-O2 diving". Proceedings of Advanced Scientific Diving Workshop. Smithsonian Institution. Retrieved 2 October 2008. ↑ Walters, KC; Gould, MT; Bachrach, EA; Butler, Frank K (2000). "Screening for oxygen sensitivity in U.S. Navy combat swimmers". Undersea and Hyperbaric Medicine. 27 (1): 21–6. PMID 10813436. Retrieved 2 October 2008. ↑ Butler, Frank K; Knafelc, ME (1986). "Screening for oxygen intolerance in U.S. Navy divers". Undersea Biomedical Research. 13 (1): 91–8. 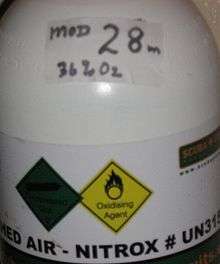 PMID 3705251. Retrieved 2 October 2008. 1 2 Yildiz, S; Ay, H; Qyrdedi, T (2004). "Central nervous system oxygen toxicity during routine hyperbaric oxygen therapy". Undersea and Hyperbaric Medicine. Undersea and Hyperbaric Medical Society, Inc. 31 (2): 189–90. PMID 15485078. Retrieved 3 October 2008. ↑ Hampson, Neal; Atik, D (2003). "Central nervous system oxygen toxicity during routine hyperbaric oxygen therapy". Undersea and Hyperbaric Medicine. Undersea and Hyperbaric Medical Society, Inc. 30 (2): 147–53. PMID 12964858. Retrieved 20 October 2008. ↑ Yildiz, S; Aktas, S; Cimsit, M; Ay, H; Togrol, E (2004). "Seizure incidence in 80,000 patient treatments with hyperbaric oxygen". Aviation, Space, and Environmental Medicine. 75 (11): 992–994. PMID 15559001. Retrieved 1 July 2009. ↑ British Sub-aqua Club (1985). Sport diving : the British Sub-Aqua Club diving manual. London: Stanley Paul. p. 110. ISBN 0-09-163831-3. OCLC 12807848. ↑ Behnke, Alfred R; Johnson, FS; Poppen, JR; Motley, EP (1935). "The effect of oxygen on man at pressures from 1 to 4 atmospheres". American Journal of Physiology. 110: 565–572. Note: 1 atmosphere (atm) is 1.013 bars. ↑ Behnke, Alfred R; Forbes, HS; Motley, EP (1935). "Circulatory and visual effects of oxygen at 3 atmospheres pressure". American Journal of Physiology. 114: 436–442. Note: 1 atmosphere (atm) is 1.013 bars. ↑ Taylor, Larry "Harris" (1993). "Oxygen Enriched Air: A New Breathing Mix?". IANTD Journal. Retrieved 29 May 2008. ↑ Davis, Robert H (1955). Deep Diving and Submarine Operations (6th ed.). Tolworth, Surbiton, Surrey: Siebe Gorman & Company Ltd. p. 291. ↑ Lambertsen, Christian J; Clark, John M; Gelfand, R (2000). "The Oxygen research program, University of Pennsylvania: Physiologic interactions of oxygen and carbon dioxide effects and relations to hyperoxic toxicity, therapy, and decompression. Summation: 1940 to 1999". EBSDC-IFEM Report No. 3-1-2000. Philadelphia, PA: Environmental Biomedical Stress Data Center, Institute for Environmental Medicine, University of Pennsylvania Medical Center. ↑ Vann, Richard D (2004). 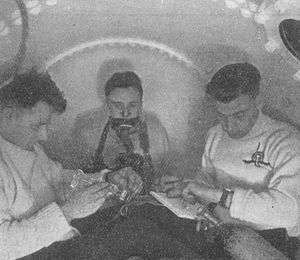 "Lambertsen and O2: Beginnings of operational physiology". Undersea and Hyperbaric Medicine. 31 (1): 21–31. PMID 15233157. Retrieved 29 April 2008. ↑ Northway, WH; Rosan, RC; Porter, DY (1967). "Pulmonary disease following respirator therapy of hyaline-membrane disease. Bronchopulmonary dysplasia". New England Journal of Medicine. 276 (7): 357–68. doi:10.1056/NEJM196702162760701. PMID 5334613. ↑ Shennan, AT; Dunn, MS; Ohlsson, A; Lennox, K; Hoskins, EM (1988). "Abnormal pulmonary outcomes in premature infants: prediction from oxygen requirement in the neonatal period". Pediatrics. 82 (4): 527–32. PMID 3174313. ↑ Palta, Mari; Sadek, Mona; Barnet, Jodi H; et al. (January 1998). "Evaluation of criteria for chronic lung disease in surviving very low birth weight infants. Newborn Lung Project". Journal of Pediatrics. 132 (1): 57–63. doi:10.1016/S0022-3476(98)70485-8. PMID 9470001. ↑ Natoli, MJ; Vann, Richard D (1996). "Factors Affecting CNS Oxygen Toxicity in Humans". Report to the U.S. Office of Naval Research. Durham, NC: Duke University. Retrieved 29 April 2008. ↑ Hof, DG; Dexter, JD; Mengel, CE (1971). "Effect of circadian rhythm on CNS oxygen toxicity". Aerospace Medicine. 42 (12): 1293–6. PMID 5130131. ↑ Torley, LW; Weiss, HS (1975). "Effects of age and magnesium ions on oxygen toxicity in the neonate chicken". Undersea Biomedical Research. 2 (3): 223–7. PMID 15622741. Retrieved 20 September 2008. ↑ Troy, SS; Ford, DH (1972). "Hormonal protection of rats breathing oxygen at high pressure". Acta Neurologica Scandinavica. 48 (2): 231–42. doi:10.1111/j.1600-0404.1972.tb07544.x. PMID 5061633. ↑ Hart, George B; Strauss, Michael B (2007). "Gender differences in human skeletal muscle and subcutaneous tissue gases under ambient and hyperbaric oxygen conditions". Undersea and Hyperbaric Medicine. 34 (3): 147–61. PMID 17672171. Retrieved 20 September 2008. ↑ Shykoff, Barbara E (2007). "Performance of various models in predicting vital capacity changes caused by breathing high oxygen partial pressures". Nedu-Tr-07-13. Panama City, FL: U.S. Naval Experimental Diving Unit Technical Report. Retrieved 6 June 2008. ↑ British Sub-Aqua Club (2006). "The Ocean Diver Nitrox Workshop" (PDF). British Sub-Aqua Club. p. 6. Retrieved 15 September 2010. 1 2 Bren, Linda (November–December 2002). "Oxygen Bars: Is a Breath of Fresh Air Worth It?". FDA Consumer magazine. Retrieved 26 June 2009. ↑ "O2 Planet – Exercise and Fitness Equipment". O2Planet LLC. 2006. Retrieved 21 October 2008. Clark, James M; Thom, Stephen R (2003). "Oxygen under pressure". In Brubakk, Alf O; Neuman, Tom S. Bennett and Elliott's physiology and medicine of diving (5th ed.). United States: Saunders. pp. 358–418. ISBN 978-0-7020-2571-6. OCLC 51607923. Clark, John M; Lambertsen, Christian J (1970). "Pulmonary oxygen tolerance in man and derivation of pulmonary oxygen tolerance curves". IFEM Report No. 1-70. Philadelphia, PA: Environmental Biomedical Stress Data Center, Institute for Environmental Medicine, University of Pennsylvania Medical Center. Retrieved 29 April 2008. Donald, Kenneth W (1947). "Oxygen Poisoning in Man: Part I". British Medical Journal. 1 (4506): 667–672. doi:10.1136/bmj.1.4506.667. PMC 2053251 . PMID 20248086. Donald, Kenneth W (1947). "Oxygen Poisoning in Man: Part II". British Medical Journal. 1 (4507): 712–717. doi:10.1136/bmj.1.4507.712. PMC 2053400 . PMID 20248096. Donald, Kenneth W (1992). Oxygen and the diver. UK: Harley Swan, 237 pages. ISBN 1-85421-176-5. OCLC 26894235. Hamilton, Robert W; Thalmann, Edward D (2003). "Decompression practice". In Brubakk, Alf O; Neuman, Tom S. Bennett and Elliott's physiology and medicine of diving (5th ed.). United States: Saunders. pp. 475–479. ISBN 978-0-7020-2571-6. OCLC 51607923. Regillo, Carl D; Brown, Gary C; Flynn, Harry W (1998). Vitreoretinal Disease: The Essentials. New York: Thieme, 693 pages. ISBN 978-0-86577-761-3. OCLC 39170393. U.S. Navy Supervisor of Diving (2011). U.S. Navy Diving Manual (PDF). SS521-AG-PRO-010 0910-LP-106-0957, revision 6 with Change A entered. U.S. Naval Sea Systems Command. Retrieved 29 Jan 2015. Lamb, John S. (1999). The Practice of Oxygen Measurement for Divers. Flagstaff: Best Publishing, 120 pages. ISBN 0-941332-68-3. OCLC 44018369. Lippmann, John; Bugg, Stan (1993). The Diving Emergency Handbook. Teddington, UK: Underwater World Publications. ISBN 0-946020-18-3. OCLC 52056845. Lippmann, John; Mitchell, Simon (2005). "Oxygen". Deeper into Diving (2nd ed.). Victoria, Australia: J.L. Publications. pp. 121–4. ISBN 0-9752290-1-X. OCLC 66524750. Rajiah, Prabhakar (11 March 2009). "Bronchopulmonary Dysplasia". eMedicine. Retrieved 29 June 2009. – Concise clinical overview with extensive references.